Here's a shot that I took in 1969, when DHL999 was still in service with the brigade. What a super shot this is! Its just as lovely as the South Shields one, and the unrestored Newcastle one (420JVK)Is the machine still around now? Added by Chris Hall on 03 October 2011. A proper fire engine !!!! Added by Barrie Green on 04 October 2011. Chris do you mean SVK 420? If so then yes it is still around. Added by Davey G on 05 October 2011. Thats the one Davey G. Do you know what its current status is? The last time I saw it (a couple of years ago now) It was attending Preston Park and complete and running, but unrestored. Added by Chris Hall on 06 October 2011. Davey: Chris must surely mean SVK 420, the brigade never had anything at all with the plate 420 JVK. Added by Ian Moore on 06 October 2011. Added by Davey G on 06 October 2011. 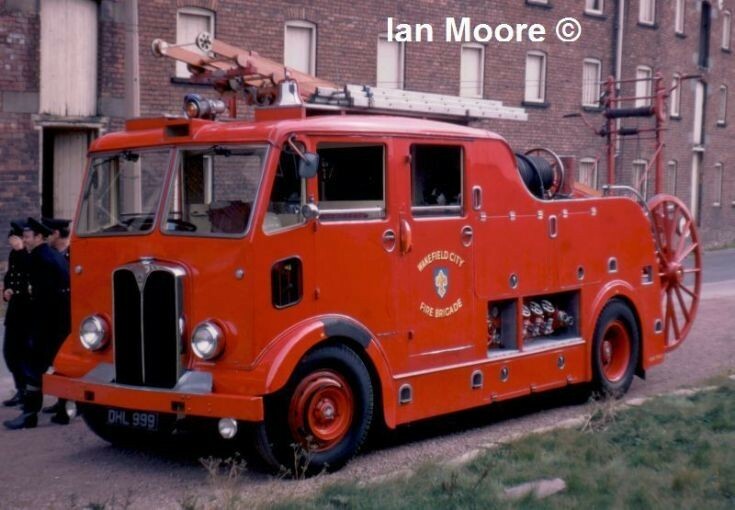 When fire-engines were fire-engines, canvas hose smelt devine and cabs smelt of smoke. Glory days. Wonderful photo Ian. Many thanks for sharing it. Added by Andrew Middleton on 06 October 2011. The last time I went to see SVK 420 (late 1990's ) it had an electrical problem but it was still great, to drive it down the lane and back, if only I could have brought it home. Added by Paul Staniland on 06 October 2011. A great old English rig. To these American eyes, this is what the Beatles were referring to in "Penny Lane". Added by Michael Feldman on 07 October 2011. Do you have any of the F8 (FHL 650) that ran alongside this PE as a friend has it and is desperate for 'in service pictures' ? Added by Rick Loudon on 09 October 2011. My friend in Edinburgh has just purchased DHL 999! Added by Brian on 11 December 2014. Added by Denis Williams on 13 December 2014. I know the chap who owns dhl999! Added by on 07 September 2016. Does anyone know who the men are in the photo. I am told one may be my father. Added by Gill Speight on 22 March 2017.